Just 10 minutes away from Westlake Corner and across from The Boardwalk community, you will find the wonderful area known as The Farm. Keeping in mind the impacts of storm water runoff, The Farm, a green community, was designed as a low-impact development using open space throughout the community. 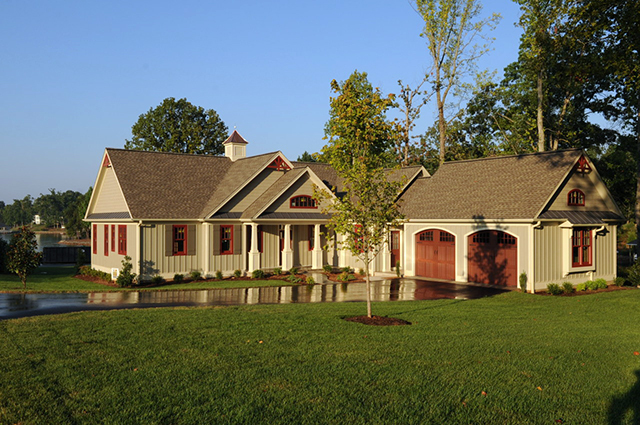 This community truly reflects the feel of Franklin County and the rich heritage of Virginia. Featuring 63 properties, the home sites and estate home sites have convenient access to Smith Mountain Lake through the community boat ramp. There are 17 waterfront homes in Hammock Pointe, the first neighborhood in The Farm, and also 13 estate home sites ranging in size, to build the home of your dreams. There are plenty of options available for those seeking residence in The Farm. Hammock Pointe is built according to the standards of the Green Building Program, which take into account durability, energy efficiency, waste management and water conservation. It creates a healthy and better living environment for residents. The amenities of The Farm include a community boat storage area, community dock, and a pool and picnic pavilion offering activities and fun for the whole family. Owning property in The Farm also gives residents the opportunity to join The Waterfront Country Club, where they can enjoy golf, tennis, and fine dining. This is a great way to meet other members in the Smith Mountain Lake communities. Smith Mountain Lake is conveniently located minutes from shopping, dining and entertainment. Known as the “Jewel of the Blue Ridge Mountains,” Smith Mountain Lake is an attractive option for those seeking a quality lifestyle while engaging in activities fun for the whole family. With its mild climate and perfect views of the Blue Ridge Mountains, Smith Mountain Lake is truly a hidden gem! Please continue to browse my website and consider looking at what Smith Mountain Lake and the pristine communities within it have to offer. When it comes to buying or selling real estate at Smith Mountain Lake, I am excited to help you buy or sell your home. As someone who has called Smith Mountain Lake home for over 20 years, I am knowledgeable in what the area has to offer and can show you affordable properties that fit your budget while giving you the upscale feel you desire. Give me a call today!